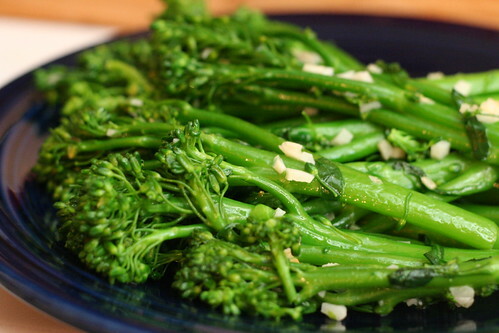 Broccoli is one of my favorite veggies, and I love its delicate baby sibling broccolini just as much, if not more. This recipe is my new go-to veggie side dish. I've made it a few times in the last couple of weeks with a wide variety of main courses. I've been making an effort lately to choose recipes honoring the recently departed Gourmet magazine. This one proves that their recipes aren't all complicated or time-consuming like you might think. It's simple, with only a few ingredients, and really brings out the flavor of the fresh produce. It's especially appealing if you're a garlic fan like me. 1. Cook broccolini in a 6- to 8-quart pot of boiling salted water until stems are crisp-tender, about 5 minutes, plunge quickly into ice water to stop the cooking, then drain in a colander. 2. Heat oil in a 12-inch heavy skillet over moderately high heat until hot but not smoking, then sauté garlic, stirring, until pale golden, about 30 seconds. Add broccolini, salt, and pepper and cook, tossing, until heated through, about 2 minutes. This is great! I am always looking for a great tasting, simple side dish that offers a lot of nutrition. Thanks for another great recipe!!! YUM!! I haven't had broccolini yet, but broccoli is a staple in my house. This looks like a lovely way to enjoy the vegetable =D. Also - congrats on winning that cookbook! Yum. Sounds like a great simple side dish. I'll give it a try soon. See... you can totally make mini things! Mini broccoli counts! Ha ha. It's so true... Gourmet has so many approachable recipes. 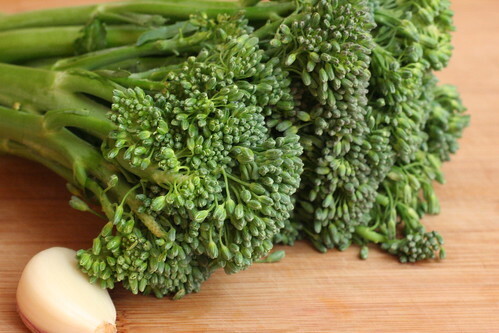 I love broccolini, I discovered by accident once when trying to purchase broccoli rabe. I love to just saute it up simple like this, so good! Yay! I always feel like such a weirdo for loving broccoli as much as I do; it's nice to find someone else for whom broccoli is a favorite. :) Looks delicious! Sauteed broccoli has basically been my only source of greens for years. However, I prefer to steam the broccoli as it is a little gentler on the nutrients.